Warmer and drier conditions are expected until at least December. Picture: Bureau of Meteorology. MUCH of Australia may be in line for a chilly weekend but don't count on that being a sign of things to come. Quite the contrary in fact. Meteorologists have forecasted that the reminder of spring will be drier than usual with an increased bushfire risk, particularly in the country's south east. 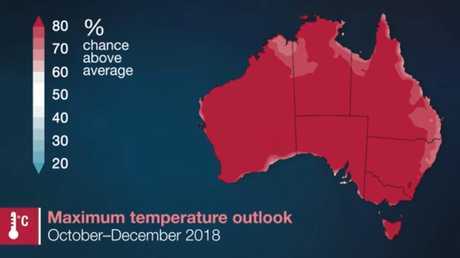 The Bureau of Metrology (BOM) has released its three monthly climate outlook which looks ahead to December. It's too early to be sure, but all the signs are it could be a very toasty Christmas. Dr Paul Feikema, a senior hydrologist at the Bureau, said an expected El Nino system, which can bring hotter weather to the east coast, might not kick in until at least December. But that didn't mean we were off the hook when it came to the sweltering conditions. 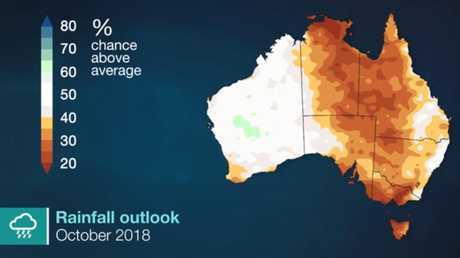 "It's a dry outlook for much of the country with warmer than average days very likely for most of Australia," Dr Feikema said. Looking back, Dr Feikema said September would go down as one of the hottest months on record in Australia. "Alice Springs didn't have a drop of rain for 161 days, its longest dry spell on record." The dry conditions have led to a reduction in overall dam levels. In south eastern Victoria, water storages are at 33 per cent, down from 47 per cent at this time last year. Dam levels are also lower along the Murray Darling system and the NSW coast. But in south west Western Australia and Tasmania water levels have increased. 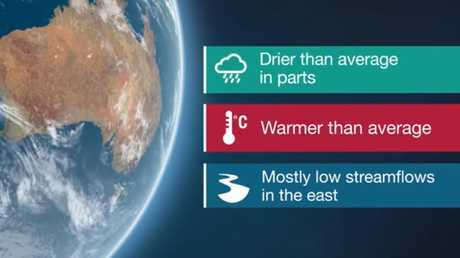 Major climate drivers such as the Indian Ocean Dipole and the El Nino, that often bring drier conditions to much of the east, are stuck in neutral. Although, El Nino could make an appearance in December. "That would be a very late start for El Nino but not unprecedented," Dr Feikema said. 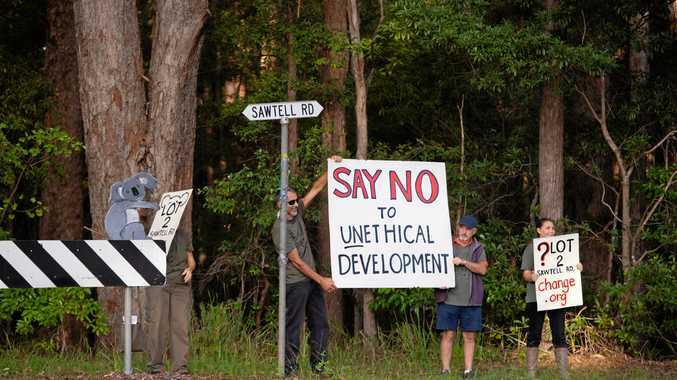 However, that doesn't mean the climate drivers aren't influencing Australia, coupled with a global long-term increasing trend in air and ocean temperatures. "The above average daytime temperatures observed across Australia so far in 2018 are likely to continue for the remainder of the year. "Nights are also likely to be warmer than average across Australia, except for the northeastern Northern Territory and the northern to central coast of Queensland, where the chances of warmer or cooler nights are roughly equal." El scorchio. Picture: Bureau of Meteorology. Over most of the country there is around an 80 per chance of warmer weather than the average. The BOM outlook stated current drought areas were unlikely to see significant respite in the coming three months. However, during October average rainfall could fall over most of Western Australia, western South Australia and parts of the east coast to the east of the Great Dividing Range. There was an above normal bushfire risk in forested areas of the east coast, South Australia and Western Australia. But drought conditions stunting growth has meant grassland areas may be less badly hit as their simply isn't the level of fuel available. October could see average rain in the NSW east coast. Picture: Bureau of Meteorology.